Missouri State University was not Gabriela Rivero’s first choice. 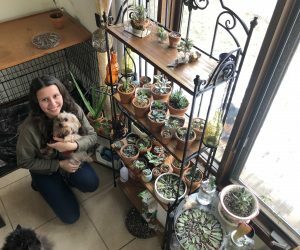 Though she’s an international student from Bogotá, Colombia, she spent her high school years down the street from Missouri State at Parkview High School. Like many local students, she yearned to spread her wings and travel to a new city to attend college. Her family had other ideas. The Riveros have been a family of Bears since Gabriela’s older brother, Manuel Rivero, traveled to Springfield in 2009 to study at the English Language Institute (ELI). Her older sister, Paula Rivero, joined the ELI for a summer youth program in 2012 and then came back for university studies in 2013. Her mother, Martha Ramírez, joined the ELI in 2015. When Gabriela came to the United States she was eager to carve her own path, but her family convinced her otherwise. Gabriela changed her mind about Missouri State almost instantly once the semester started. It was apparent early on that Missouri State faculty and staff genuinely care for students. In the classroom, she found subjects she was passionate about and declared a major in Wildlife Conservation and Management. It fits her love for animals and the natural world and she looks forward to opportunities to apply her knowledge towards a more sustainable future. She’s eager to get involved on campus, but right now you’ll find her in the library. Her favorite spot on campus has everything you need for academic success. Her grades are her biggest focus at the moment, and she’s more excited about learning than she’s ever been before. After she completes her degree, she hopes to take her talents to Washington, D.C. There, she’ll try to work at an organization like the World Wildlife Fund. 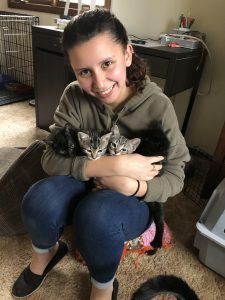 Gabriela’s passion for animals has been evident in her community service and volunteerism for the Humane Society of Southwest Missouri. She’s been an active volunteer in the shelter and has opened her home to foster kittens who need additional care. Her dedication to the natural world also comes through her green thumb. Gabriela gardens in her free time and her collection of houseplants rivals any greenhouse. Her gardens give her space to relax into her other hobby, classic literature. Her current pick is The Picture of Dorian Gray by Oscar Wilde.